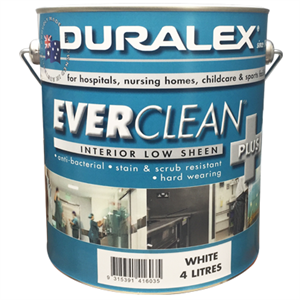 Duralex EVERCLEAN PLUS Interior acrylic Low Sheen is a premium, hard wearing and stain resistant water based paint designed to withstand general cleaning cycles in clinical and hard working environments. The low VOC, low odour formula ensures quick return to service with less disruption. EVERCLEAN PLUS has been developed with antimicrobe technology which, when combined with clinical cleaning programmes, helps assist in the protection against mould, mildew and bacterial growth, to keep surfaces clean and help maintain good indoor air quality. Sizes 4L, 10L, 15L and 20L.